We certainly live in troubled times, and the future often seems murky at best. In times like these, we need somewhere dependable to turn, a place tried and true. Thankfully, for the Christian, we have that perfect refuge in Jesus Christ. I believe that need applies to all areas of life, even music. I find it comforting to know that there are some places I can go for music that I can depend on, that are tried and true. 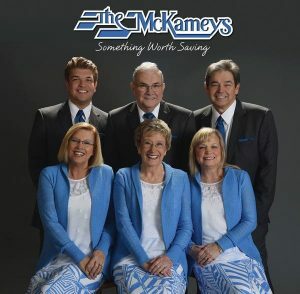 There may be no greater example of this in gospel music than the McKameys. No matter what’s going on, I know I can put in a McKameys CD and get simple music with a simple, but oh, so needed message of Biblical truth. The McKameys are back in 2016, their 51st year, with another strong collection of new songs, Something Worth Saving. As has been the case the last few years, each of the male members of the McKameys gets one feature song, and each one on Something Worth Saving is very different. Ruben has the aforementioned mountain gospel song. Young Eli Fortner sings “I Believe,” which might be described as “rockabilly”. Roger Fortner is featured on “A Few Things,” which is country, country, country…positively dripping with steel guitar. The gentlemen McKameys can always be counted on to toss some variety into the mix. The remainder of the songs feature the “second-generation” McKamey ladies, Sheryl Farris and Connie Fortner. As usual for the group, these songs span a wider stylistic spectrum than many might think, all the while maintaining the family’s signature instrumental simplicity, letting the lyrics stand out. On the more modern end are the worship song, “Christ Is Able,” which opens the album, and the album closer, the prayerful “Come to My Rescue”. On the more traditional side are “Days Gone By,” with Connie singing of the faithfulness of the Lord, and “That’s Why There’s a Cross”. The latter is probably the recording’s most powerful performance, with a building chorus that proclaims the power of Christ’s sacrifice on Calvary. If you buy the physical CD of any McKameys recording (at least all the ones I have), you’ll find my favorite attribute of the group within the album insert. You’ll see the lyrics for every song printed, and right at the top of each lyric, you’ll find a Biblical reference for the song. Folks, that’s what gospel music is about. No matter who’s singing or who’s playing what instruments, it’s about God’s Word put in a vehicle that delivers it to the ear, the mind, and the heart. The McKameys understand this, and demonstrate this as well as anyone. When your troubled heart is seeking for a comforting song, you won’t go wrong with the McKameys and Something Worth Saving.